Recently an experience reminded of a very valuable lesson in creativity. It’s something I had known conceptually, but this experienced allowed me to see it in a multi-dimensional array of it’s application and meaning. The experience was this: I had been asked to perform a spoken word and I instead suggested that I write my own version of the piece and perform it instead (I prefer doing my originals versus covers…it’s probably a Hip-Hop thing, definitely a Hip-Hop thing). They were very gracious and allowed me a shot at it, but in the end they wanted to go with the original and not my piece. At first I was DEVESTATED . I spent SO MUCH TIME working on this piece. It was just as good, if not better than the original. How could they not see that?!? I even asked if they would give me feedback about parts that could be better when I submitted it. They just weren’t feeling it. They reached out to me because they wanted me to perform the cover of the song, NOT to write an original. Because this was what they envisioned, there is not a version I could have written that would have come up with that would have swayed them. They were wanting one thing and I was trying to give them another. It would be like me calling Pizza Hut for pepperoni pizza and the guy on the phone suggesting I try one with chicken. I don’t think Pizza Hut makes terrible pizzas, nor do I question the pizza making ability of the pizza person, it’s just when I called I had been craving a pepperoni pizza not chicken. I love chicken, but I just don’t want it on my pizza at this particular time. I was the pizza person on the phone in that analogy and the group contracting me for the spoken word were the people calling the pizza place. It’s not that they think that I’m a horrible spoken word artist (in fact they extremely pleased with the spoken word piece I created for them on a past occasion) nor do they doubt my skills as an artist, they simply just wanted something different than what I was offering. It was void of any element that I could take personally. When I realized this a shift happened. It’s one of the most essential shifts a creative can make. The art is yours to create, but you have to divorce yourself from it’s reception. I used to get so hung up on putting something out, and people not liking it, it not getting the shares/likes/plays that I thought it should. It would really weigh me down. I realized that once you put it out, you have no control over how it is perceived. People may love it, and that’s what every creative wants, but the reality is some people wont. It’s possible that a lot of people wont. Your job as a creative is to pour all of yourself into the offering, and then divorce yourself from the results. If it’s received well, be grateful and move on. If it’s not received well, do your best to understand/appreciate why and move on. It’s poisonous to allow the reception of a single work to validate/invalidate your perception of your ability/talent as a creative. NEVER DO THAT. Sometimes, it’s ahead of it’s time, sometimes we didn’t execute well, other times the audience had a taste for something else. Just remember, sometimes you won’t know why right away or ever. The not knowing why/taking it too personally as well as trying to make sure they create something that will be as successful as their last big success keeps artists chained to a moment in their creative journey. They become imprisoned never growing past that success, or failure. You may never know why, but divorcing yourself from the result allows you to continue moving and growing. You can do whatever you want. It’s art. Hey sooo if you loved this article, give me a clap or two! The day has finally come. My fiancee got us tickets to see Black Panther as a Valentine’s Day gift at a very nice theatre. After watching the movie 24 hours ago and writing about why Black Panther matters so much, I decided to put together a review. I absolutely loved it. I enjoyed it for so many different reasons and on so many different levels. I had a feeling that I was going to love it, but I didn’t know that I would love it so much. I took some time to elaborate on some tangible elements that jumped out to me that really made the film incredible. Pacing in a movie is an art in and of itself. Even though you have technically just three parts to work with (beginning, middle, end) making sure that you develop each proportionally is difficult to do. Too much setting the stage with character development in the beginning and you either have to rush the end or risk not taking enough time to establish the conflict between characters in the middle. Each part of the story bears importance, but not more than the other two. The BP storyline nails the pacing problem perfectly balancing the three acts. The very beginning sets the storyline for the origin Wakanda and the Black Panther and it picks up right after the death of his father which was depicted in Captain America: Civil War. Even if you didn’t see that film, the flashbacks that T’Challa has as the movie unfolds bring the viewer up to speed that makes sense and feels unforced. There are various characters that are being devleoped through end of the beginning and into the middle of the plot. This ongoing develpoment in the middle along with steady stream of action as well as conflict being introduced kept me engaged and invested. Doing much of the heavy lifting in the first two scenes set up a final culmination that was very climactic and didn’t feel rushed. I was surprised with how multifaceted and the detail to which Wakanda was depicted. I enjoyed seeing how the country was “hidden in plain sight” with the invisible force field. The countryside of farmers agriculture was the part that the world knew but as they fly into the protected air space you are taken past the invisibile barrier to the real Wakanda. It’s such a little thing but I enjoyed it so much. Also the depth and vastness of the Vibranium resources inside the mountain was incredibly demonstrated. It seemed infinite with teams of magnetic trains transporting the resource throughout the mountain. I have seen it in a couple of different cartoons, but BP displays it in such a way that you can really get a sense of the abundance of the metal. Lastly, the tech of Wakanda was impressively displayed. From weapons to gadgets to T’Challas new and improved nanite suit that absorbs and redistributes kinetic energy. Another piece of tech that I enjoyed was the ability to control and drive cars in another part of the world from the lab in Wakanda remotely. The technological reputation of Wakanda was upheld very well and didn’t disapoint. 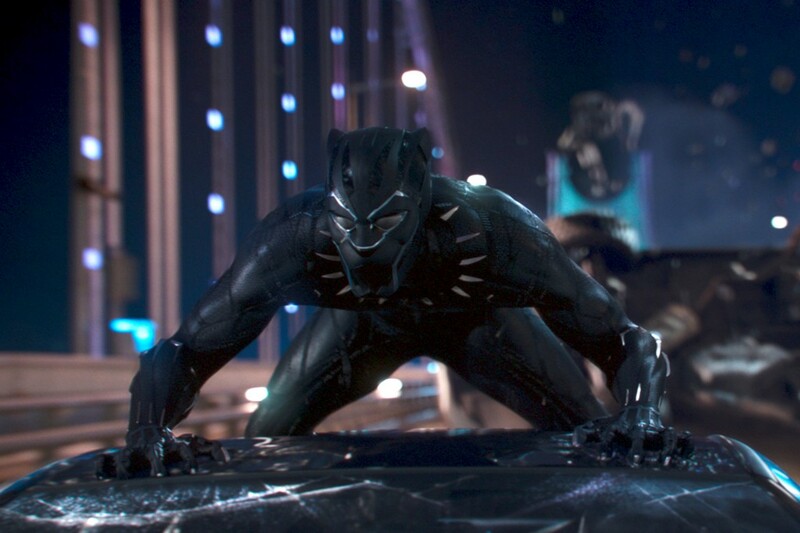 Chadwick Boseman masterfully pulls the curtain back giving us a unique glance into the many levels of tension that are working underneath the surface of the T’Challa/Black Panther. He’s a prince who, though he has earned his throne, doesn’t feel prepared to be a King. He’s trying to feel out a relationship with his ex. He’s an older brother who enjoys his camaraderie with his younger sister. He’s a hero flipping cars and landing on other cars, tearing wheels off of axels while moving, and taking gunfire without flinching. He’s a son who has to come to grips with the sins of his father and try to mitigate the repercussions as a the new king and Black Panther. T’Challa displays a range of amazing, fearless, vulnerable, and human and Chadwick emotes these all in a way that is very believable. The women of BP shine so spectacularly bright. They are given room to display the strength and wisdom that proves to be incredibly valuable to T’Challa/Black Panther and the film overall. 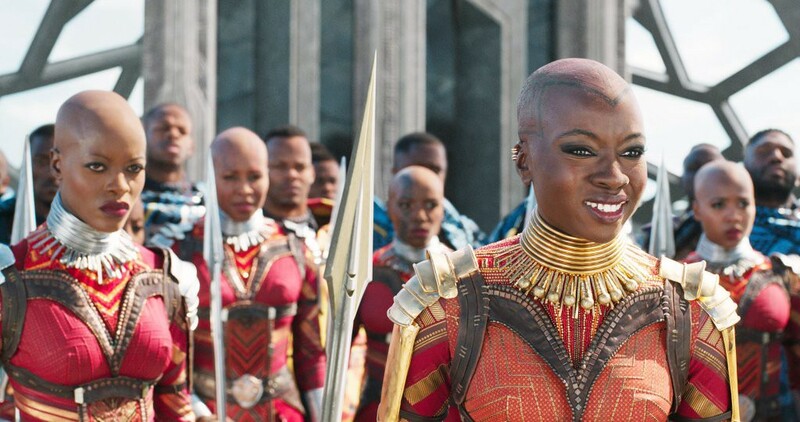 T’Challa’s main general and captain of the guard, Okoye (Danai Gurira) is known as Wakanda’s fiercest and most skilled warrior. She travels with T’Challa as his bodyguard and is devoted to protecting the throne. A stand out moment is when her love interest (W’Kabi-Daniel Kaluuya) gets in between her and her duty and she informs that she would kill him without question if he persisted. 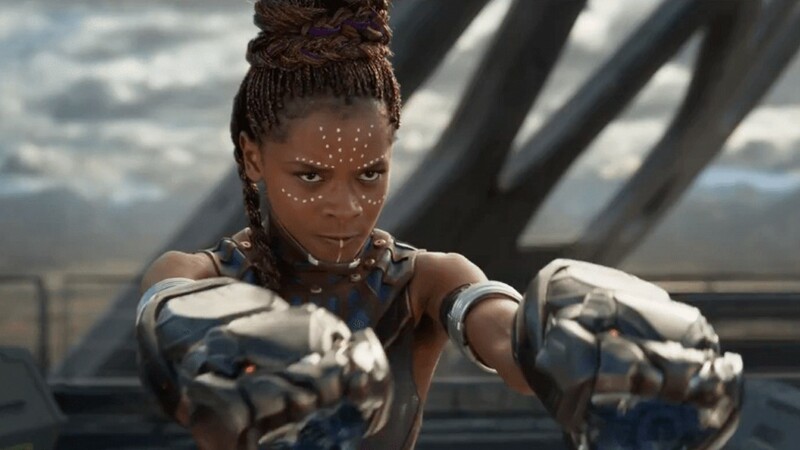 T’Challa’s little sister Shuri (Letitia Wright) is not only princess of Wakanda, but she is a brilliant scientist and the mastermind behind all of Black Panther’s tech. Much like Q is to 007, Shuri’s gadgets and enhancements to Black Panther’s suit keep him one step ahead. She is witty and funny, but more than that very intelligent. I am here for these ladies commanding these roles because it provides such an inspirational example to young girls, especially young black girls. It shows that they can be strong enough to lead an army, and smart enough to be an awesome scientist. Seeing these roles acted out gave me goosebumps similiar to the ones I had watching Gal Gadot kill it as Diana in Wonder Woman. 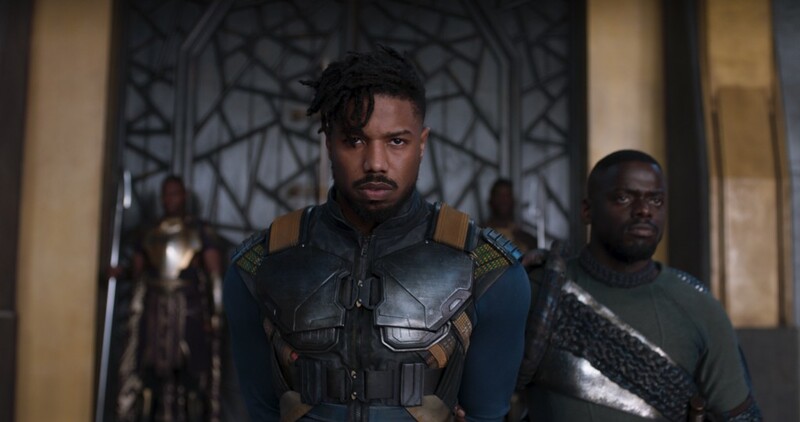 It’s easy to not like the villain, Erik Killmonger (Michael B. Jordan) in this film, but it easy to understand him. He grows up poor, disadvantaged, and in a broken home in Oakland. He finds his father murdered and later discovers he was killed by his uncle King T’Chaka. From that realization he begins his journey for vengence and the throne of Wakanda leaving a trail of killing in his wake. Further fueling his rage is seeing and knowing the struggle of black people across the globe while also seeing Wakanda’s perceived indifference. I found myself being able to understand that Killmonger was more of a product of his circumstances than just someone who is pure evil. He’s trying to make sense of his circumstances in the way he knows best. I was sad that he rejected T’Challa’s offer to heal him. It made more sense as I thought about it because his life purpose became getting revenge to the point that when it couldn’t be realized, he couldn’t see a reason to continue living. In either world life would mean becoming a prisoner. Outside Wakanda, he would surely answer for his crimes and be imprisoned. In Wakanda he would likely be imprisoned or be relegated to some position taking orders from the King painfully reminding him of the loss of his father. Though he was sinister, I totally understood where he was operating from. I could see the hurting human acting out underneath. I appreciated the detail in displaying the dichotomy of sinister versus sympathetic. Overall, this was a grand slam on the biggest stage. 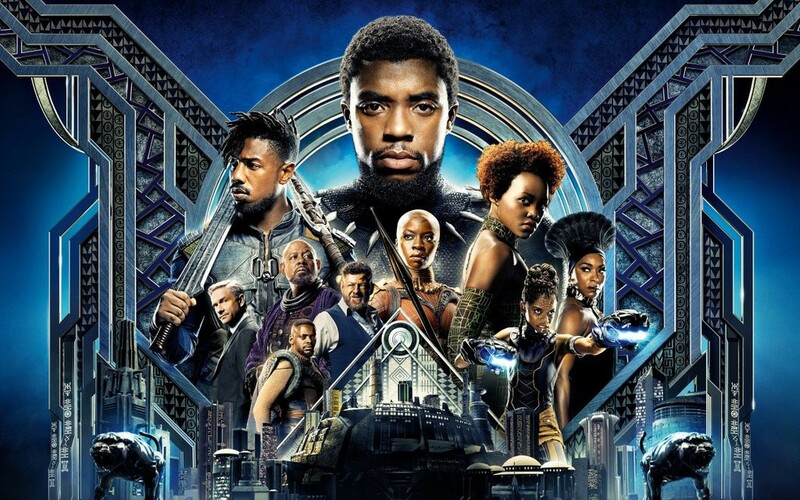 Marvel took a insanely huge risk pouring 200 million dollars into a film of a lesser known character, with a 90% black cast, and hiring a black director, but in reviewing the box office projections and social media buzz only one day after the release date, it’s very apparent that risk paid off. Black Panther exceeded my very lofty expectations. There were moments I felt the glee and amazement of a child. There were moments I was touched. There were moments I was geeking out at all the technology. The entire time I was so proud that this movie was made. This movie felt like it was very “for us” from an African American standpoint, but it didn’t alienate other people. The acting was done exceptionally well. A lot of times with acting you get an actor playing the part rather than the actor being transformed into the character of the film. Every actor delivered their character to the point that I disassociated them from who they are in real life. Bottom line: Marvel & director Ryan Coogler took their time with this project and they got it very right. They brought a film unlike anything they or anyone else has ever done before and it has and will continue to transcend. I’ve been looking forward to Friday, February 16th for at least 18 months. It was around 18 months ago I learned that Marvel would bring Black Panther to the big screen. 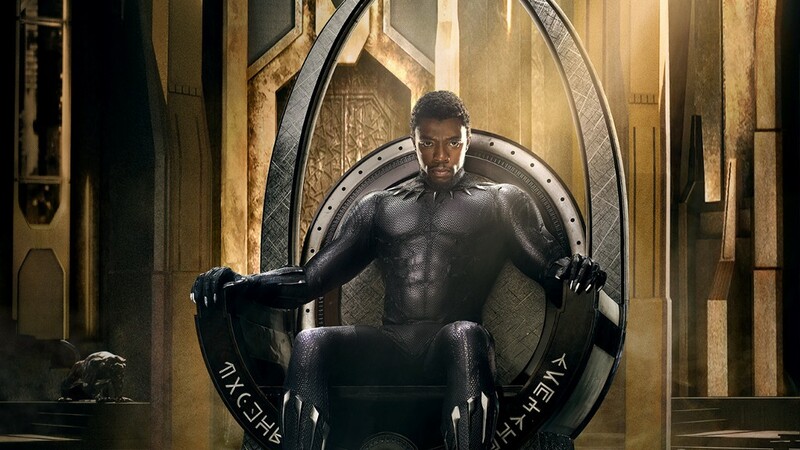 For those of you who may have just arrived from a parallel universe, Black Panther is a superhero movie that follows T’Challa who returns home to the African nation of Wakanda after the death of his father to take his place as king. Upon his return home T’Challa is challenged by a formidable enemy and must depend on his allies and the power of the Black Panther to defeat his advasaries keep his country safe. Very early on after the news of the film would be released, I noticed the excitement was higher than I’d ever seen for a franchise debut film…like StarWars level anticipation. 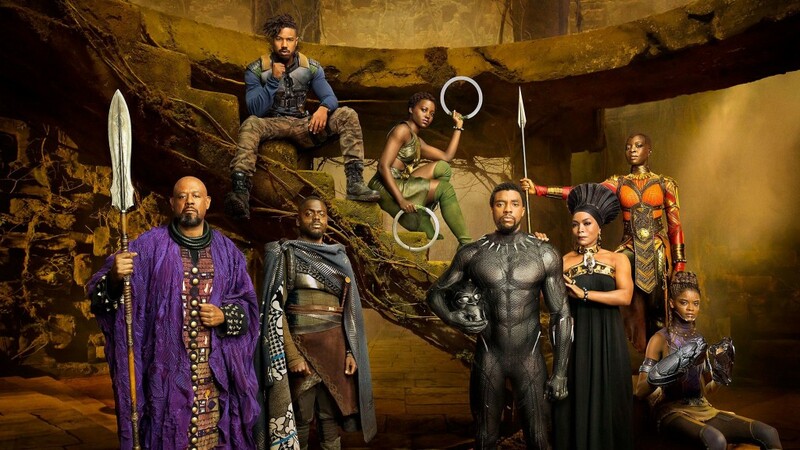 Hashtags like #BlackPantherSoLit began to emerge even with more than a year out from the release date and with every passing day and released trailer the excitement has only spread and into mainstream culture. 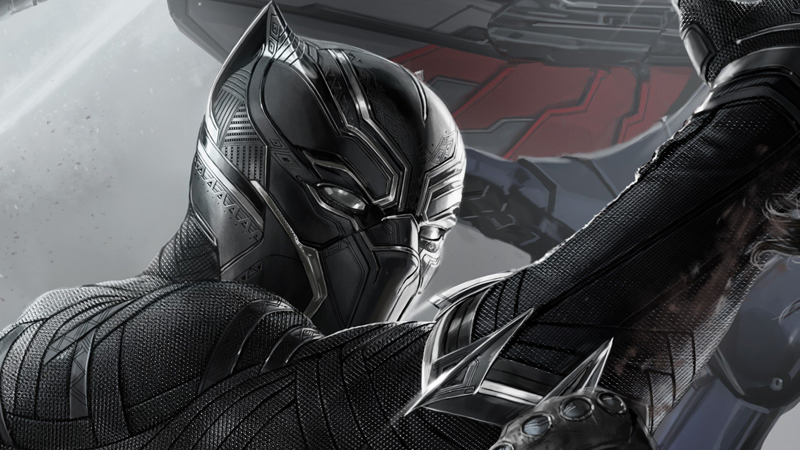 When it comes to superhero movies, black people are largely under-represented, if at all. Whether its Marvel or the DC universe if a black person happens to be included, they automatically assume the role of “sidekick” or “comic relief”. This is detrimental to black kids because when not seeing themselves represented, they can be tempted to think that they don’t belong in that space, which at times may be reinforced by other kids telling them so. I experienced this as a kid, not being able to play a certain hero because “he’s white and you’re not”. That childhood imagination gatekeeping often turns into critism when black boys and girls grow up into teenagers and young adults wanting to cosplay as their favorite heroes. Black Panther breaks the mold of the whitewashing/representation disparity as 90% of the cast is black. 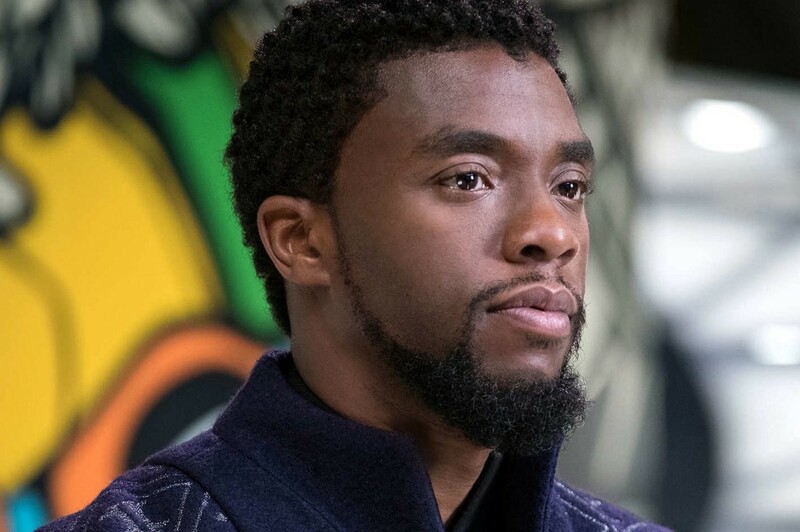 The cast features the amazing talents of Chadwick Boseman(42, Thurgood Marshall, Get On Up), Michael B. Jordan (Creed), Lupita Nyong’o, Angela Bassett, Forrest Whitaker, and others. Black Panther ensures that little black boys and girls can see themselves on screen and realize there is a place and space for them. Africa as a continent has historically and consistently been portrayed as an underdeveloped, inferior, 3rd world country in movies and cultural media. We are innandated with imagery of safaris, wild animals and people living in huts running around in loincloths chasing lions with spears to the point that many people think this is all that there is to the continent. 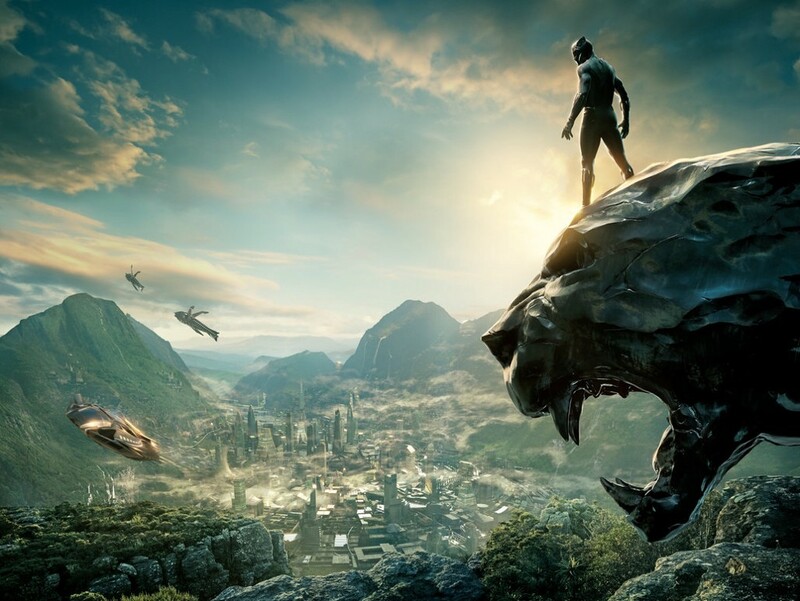 Black Panther provides a stark contrast to this portrayal as it is set in the country of Wakanda, the most technologically advanced country in the world. The country reflects the thriving of an African nation free of colonization being armed with the technological superiority to fight back. Even if it’s a fictional country, Wakanda being portrayed as the complete opposite of what the ruler of the free world thinks of African countries is a huge step in changing the narrative. 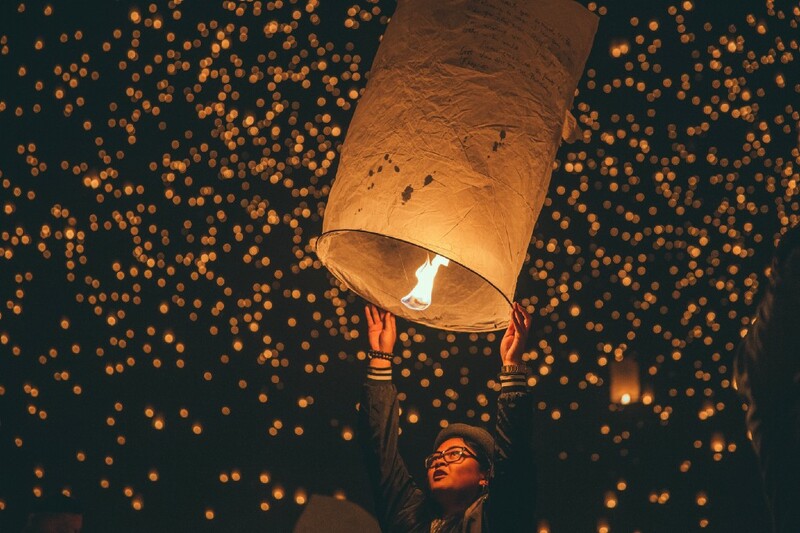 Imagery remains such an important force in our culture. It’s importantce is due to the integral part it plays in establishing a narrative. If that imagery and the narrative is adopted on a large scale, it can become embedded in the conciousness of modern and hard to separate from truth. Media and movies accomplish this and can often have lasting effects (i.e. Birth of a Nation). A majority of movies and media have often used imagery to cast black people (men in particular) as villains and criminals. Black Panther provides a movie where black boys and girls see themselves as not only heroes but royalty. It provides imagery and a fresh narrative where “villain” and “criminal” are not a default. It casts a narrative where they are not the problem, but the solution. For a major movie production company like Marvel studios to produce an unashamedly black film with equally unapologetically African roots with a 200 million dollar budget is unheard of. This movie will shatter box office records and might even possibly be among the highest grossing Marvel movie of all time. It will achieve these things because it’s not just a movie, it’s a significant cultural moment like we have yet to see. First things first, I LOVE the GRAMMYS. Even when I have felt snubbed by the committie’s choice to snub an artist I felt deserved to be nominated or to have won, I still love it. I still watch every year. It’s truly is music’s biggest night and for me as an independent artist, it’s my superbowl. I have dreams of going, and having my name called to walk up there and accept an award. Tonight I’m not watching it though. There used to be a time where, if you missed watching it live, you just simply missed it. In our “Instant, On-Demand” world we never actually miss a moment thanks to Twitter, Google, and YouTube. Thanks to these platforms, I don’t actually have to be there for those moments. I can simply relive them tomorrow and be fully caught up. I’ve always realized this but, fear of missing out (FOMO) has been a thing I have struggled with. Being the last in the know has seemed like the worst thing imaginable until recently. I am finding that being slightly out of the loop, and not knowing what is going on with everyone at all times to be somewhat freeing. We can get so caught up in always being updated on EVERYTHING that is going on that we can lose ourselves, as well as the connection to the people and things that really matter. The other reason I’m not watching is more significant. I’m not watching out of sacrifice. Yesterday was the first Saturday that I woke up at 4:45AM and made it to the kitchen table at 5 to spend the first few hours of the morning Praying, journaling, writing, and reading. Five hours flew by and I accomplished so much and still had so much of the day to plan, prepare, and relax for the week ahead. It felt amazing to have gotten so much done, and also to start my day off taking time for myself, and creative projects that were important to me that I decided this is how I want to start EVERY. SINGLE. DAY. This lead me to imagine a life where I can develop spiritually, intellectually, and creatively at each day even within the margins of a very constrained, intense work week. That life comes at a cost though. That cost is going to bed early enough to actually be able to wake up and work at 5am. For me, that is somewhere around 7:30–8:45pm. It takes a little energy and effort to be consistent in doing this, but I think more about how I’ve set a goal to write 15 songs this year and 100 songs before I decide the next chapter of my career. I think about how I want to read at least 30 books this year. every book on my Amazon wish list and so many more. I think about how much better my days are when I start them out taking time to pray, reflect on my goals/aspirations and journal. Experiencing just one day of getting to do this has made me realize that it’s worth it. Giving up whatever I have to for that time in the morning is worth it because I’m investing in the person that I want to be. The artists I would be watching tonight at some point made a commitment to invest in themselves and their craft on a daily basis. Tonight they will be reaping the rewards of that commitment. Tonight reminds me that you can prepare/invest/sacrifice to reach greatness or watch others who have. 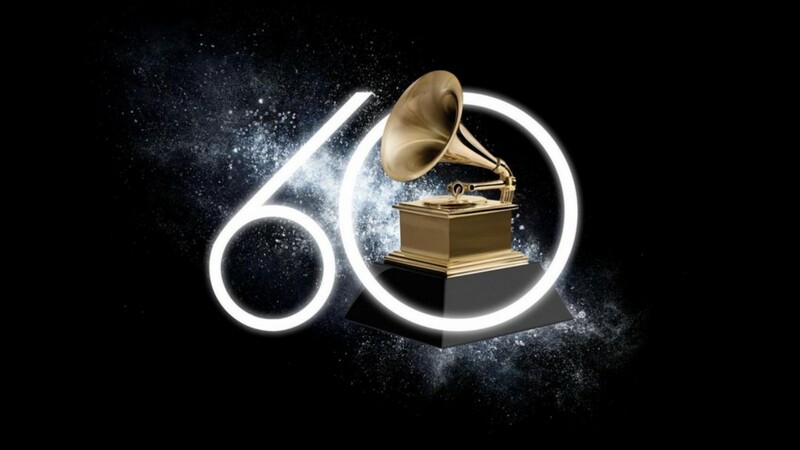 I’m not saying that if you watch the GRAMMYS you can’t be great, it’s just for me there are things I love to do that I’m sacrificing for things I love more, and also I’m not really giving up anything, just delaying gratification, which is a practice we all can benefit from. How do you invest in yourself to become better? Do you have any tips/tricks to share? Leave them in the comments below. Also if you liked the article, tap the applause button so Medium can show more folks! This is one of my favorite lyrics from a song “Failing Is Not Just For Failures” by a band Listener. I always admired this line, but as I’ve thought about it, there’s only one group of people that truly have more experience than failures: successful people. I can’t think of a better illustration of this idea than the quest of every toddler learning how to transition from crawling to walking. There are countless failed attempts, one after another, and countless more and the small breakthrough of a couple steps. It’s many more tumbles and falls before they are hobbling towards their parents with no assistance. Then walking becomes perfected over years and years of repetition and practice to the point that we do it now without a second thought. 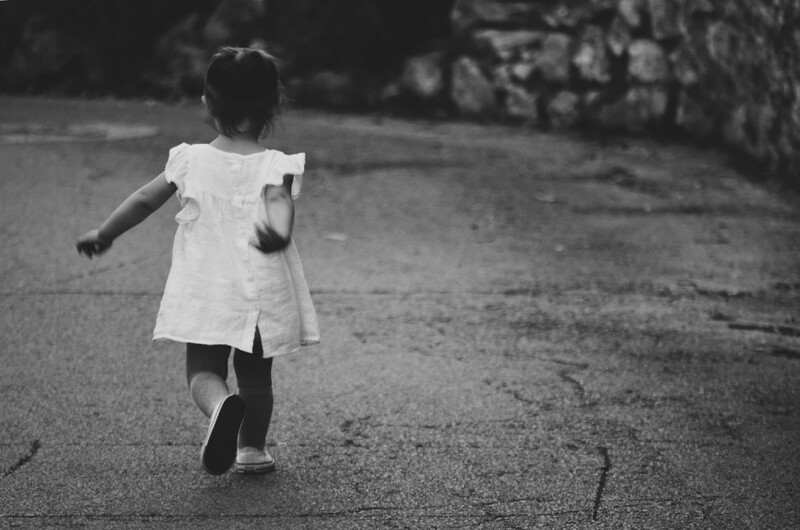 What amazes me is that at no point during that process of early childhood development does any child say “I gave this 100 tries and I’m still crawling, maybe I wasn’t supposed to walk…I’m done.” They don’t keep track, they don’t dwell on the most recent failure. They just keep going from attempt to attempt. They become failure experts. They amass an overwhelming degree of experience in failure. Their expertise and experience in failure qualifies them for success simply because they were patient enough and tenacious enough to find all the ways that didn’t work. Many of us don’t remember what it was like to try, struggle, fail, and fail again attempting to walk. It’s only through conscious deliberate thought as well as examining others who are in that stage that we even think about what that struggle must have been like and see how resilient that we actually are. The only problem is that lesson whispers in a culture that is incessantly screaming about results. We have placed an incredible amount of attention and celebration on successful results giving little consideration to the process and failures that lead there. We have become so disproportionately obsessed with results that many believe that success is the product of greatness that one is born with (or without) rather than the outcome of the process of failing repeatedly, trusting the process, working hard, and staying patient. We’ve created this gigantic canyon between us and the people we admire and aspire to be. The greatest illusion is that there is no difference between us and the Eddisons, Fords, Wrights, Jordans, Jobs, Westbrooks, Zuckerbergs, and the others we aspire to be like. It’s foolish to discount the talent of those aforementioned, but it’s equally as foolish to discount work ethic, and the process that leads to greatness in the name of talent. Each encountered many failures and disappointments that proved to be incredibly discouraging, however the one thing that ties them together is their persistence through those failures and disappointments that eventually produced the greatness we now admire. I’ve decided that as an artist, I’m going to write, record and publish at least 100 songs before I even consider hanging it up. Currently, I have 18 songs that have made it from note pad to Spotify. Out of those a probably 5 or 6 have been really well received, and even one allowed me the opportunity to work with Youtube. While all of this is great, I’m still short of where I want to be as an artist, and I believe its because I haven’t failed enough. I believe that if you aren’t where you want to be, in any area of your life, it’s perhaps because you haven’t failed enough. When you master failure, greatness isn’t far behind. I hope this finds you well. My name is Gospel Igwe and I’m a 33 year old recording artist and motivational speaker from a small town in Oklahoma. I’ve spent the last 10 years living in Phoenix, Arizona which is where I first discovered H&M in a mall in Scottsdale. Since then it has been my top choice whenever I shop for clothing and accessories. I was beyond appalled to learn about the children’s sweater that you offered on your website that contained the phrase “cutest monkey in the jungle” with an African American child on the front. Why and how this is wrong could fill an entire book (and there are several that have been written) but that is not my purpose. Instead of a tweet or post on Instagram, I decided to write you, the CEO, directly to tell you why your apology doesn’t work. I imagine realize in your position you might mostly be concerned with “big picture” issues, but I think you will agree that this incident is growing into a big picture issue that would require your wisdom and action. My hope is that you will hear my words from the perspective of someone who doesn’t look like you, nor shares your station of wealth and privilege in hopes that it would inspire you to at the very least be more informed about the ineffectiveness of your apology and at the very most take action to rectify this situation. Thank you for your patience as I make my best attempt to explain this from my perspective. Last week an image of a of a little black child modeling children’s sweater with the phrase “Cutiest Monkey In The Jungle” was posted to your site as a product for sale. This means that multiple departments and department heads (design, modeling, merchandising etc.) signed off on this before it went live on your site. Not one of them felt that this image was racist or inappropriate, or not one felt like there was an environment that would be conducive to them raising such a concern and I don’t know which is worse. In our current culture with the incredibly public racial blunders of Dove, and insensitivity of Pepsi, it seems that no one at the company in the departments tied to this going live said “hey, this doesn’t seem right.” The product went live, and discontent went viral capturing the attention of celebrities some of which terminated their partnerships with you. If you agree with the criticism, then why was the product designed and why was a black boy chosen to model it? In reference to your core values, doesn’t the fact that such an obviously racist image can go from development to live on your website show that it is in line with your core values? Could it be that your core values are wrong or that you don’t attest to them as closely as you thought? If your position is that racism is wrong, wouldn’t you want to turn the other way in a full out sprint at anything that could be contrived as racist in any way? Your solution to this problem is an apology posted to your website, a warm reassuring reminder that racism is not a part of your company, and a promise of an “internal review” to ensure that this doesn’t happen again. Your apology didn’t work because it’s lacking tangible, practical steps on how you plan to ensure this doesn’t happen again. Without those steps, this just feels like the standard damage control, cut-and-paste PR bandage we apply and hope it sticks long enough for this to blow over. I hope you can see how that is a slap in the face to people of color who fight, strive, and give their lives to exist on the same plane as their white counterparts under the same title: human being. I’ve never been the type of person to point out problems without also attempting to discuss solutions. The first one that comes to mind is terminating the department heads associated with signing off on this image being posted. Cutting ties with these people illustrates that it’s unacceptable to have this type of lapse in judgment in positions where decisions most visibly reflect the core values of the brand. More importantly, terminating these individuals is futile if you don’t fill these positions with people of color (if I’m correct, there are no people of color on your board of directors). Nothing ensures your core values being reflected than more people of color having a voice of authority at the table. I think it’s dangerous to surround yourself with people that look and think like you and after this debacle, I would hope that you see the dangers as well. Our culture has recently grown to sharply frown on sexual assault with similar consequences, and if this product manager, department head, or board member was caught in scandal of that nature would you have a need for an “internal review” or would you cut ties and replace them with someone who understands your core values? Should this be any different? Moments like this are special because they can be defining and allow you to change course placing you on the path of who/what a company aspires to be. I really enjoy shopping at H&M, but I’m immensely conflicted because I can’t help but feel like your value of me as a person is on as deep as my investment to your company, as I’m likely not in your target demographic nor do likely I look like them. I thank you for your time reading this and hope that you will do whatever tangible action on behalf of people who don’t look like you. I've heard it said that "we don't get to become what we're supposed to because we give up too soon." I've always believed that to be true, but I'm now as I approach 33 years of life I'm realizing that we also don't get to become what we're supposed to because we often play it too safe. Ive always said that I didn't want to look back over my life and wonder what life would have been like had I taken a meaningful risk. It was that desire to live a full life taking meaningful risks that lead me to quit my day job and pursue music full time. I've been doing music for 15 years, the last 5 of which have been professional while working a full-time job the entire time. The last 5 years, my 9-5 has allowed me the security of having a steady income, insurance/benefits which I've thoroughly enjoyed, but I've always wanted/dreamed of pursuing music full time. My job has been incredibly supportive in my musical endeavors allowing me the time off and flexibility to do weekend runs or even leave for a week or two for smaller tours which I have loved, but anything more than that was generally out of reach. I was okay with that and even grateful to be in the position I was in, but over time my contentment was met with a growing sense of curiosity around what I could accomplish if I was really focused on music full time. What tours could I be a part of? How much more music could I put out? How much more could I develop as an artist? So many of these questions began to fill my mind. At the same time, the company I had been a part of for 8 years began to change as well. This year we were acquired by a private equity firm and the founder/CEO was bought out. Suddenly many people whom I had known for years began to leave. I was mostly unaffected by this but then one day my supervisor pulled us into a room and told us she had gotten another job. She was the biggest supporter/advocate of my career always going above and beyond for me to try and make whatever to grant whatever request I had for Rap. She challenged me professionally and help me grow immensely. With her leaving, in addition to the company becoming more and more corporate (more red tape, more processes/procedures, more focus on the bottom line and less on people), it just seemed like my season at this job was ending. So as the signs became more clear, I was thinking "I'll just get another 9-5, work for x amount of time until I build a rapport and continue to ask off for rap stuff." I began to apply and start down this route, but then it hit me: "what if this was your opportunity to do this full time?" The more and more I thought about it, the more I realized what a unique moment it was to give it a shot. I could actually devote my 9-5 to music. I'm in a place in my life where I actually could do it and I have the support of my fiancé. We have no kids and would be newly married and she could come with me on the road a majority of the dates, but the biggest thing she offers is her support. I talked to her about it and she was incredibly supportive. After 5 years of doing music professionally, things have been really great, but I'm feeling like what got me to where I am won't get me any further. My current business model with music has worked so well, but I don't know that it will carry me into the next season of life, music, and ministry. That's what this is mostly about-seasons changing. Sometimes when seasons change some of the elements from one season won't be conducive in another. What you used to do in one season won't work in another. Additionally, a lot of problems frustration come from not realizing what season your in or if it has changed. So Monday, August 21st, a week before my 33rd birthday, I resigned from my position with my company. I traded in my cubicle for a terminal, my full-time position for my full-time passion. It's a leap of faith in every sense of the word. I've never been so terrified but also never so full of excitement, exhilaration, peace, and faith. I'm convinced this is my moment. Whether it's 3 weeks or 3 months I believe that I have to shoot my shot. So we decided to take the shot because it's better to shoot and miss than never take it and always wonder. February is known first for Valentine’s Day, and second for the other lesser known, but widely understood holiday, “Friend Zone Day.” This day typically happens on or after February 15th, when you find out the person that you like doesn’t like you as much, or in the same way as you like them. Though it’s highlighted more in this month of declaring and demonstrating love, the reality is FZD happens to countless people in the months of March to January. Every day, multitudes of people are being cast -gracefully and mercilessly into the imaginary place where the pain and awkwardness are real. I consider myself an expert on this imaginary place for many reasons. First, my “loner” status in middle and high school positioned me well to learn the ins-and-outs of the zone. I had an 8-year awkward stage, which coincided perfectly with my teenage years. What it looked like was me being told to leave when I sat to eat lunch with the cool kids in middle school, transforming to me eating lunch most days by myself in high school. I know that’s super depressing, but I’m thankful I went through it because now, I’m able to reach out to those students with my example of how I turned into someone who is confident in who they are-awkwardness, flaws and all. Another event I remember that qualifies me for expert status is the memory of having to ask a girl to ask me to the Sadie Hawkins dance. Further cementing my expertise was that the overwhelming majority of my teenage years are characterized by the constant dwelling in the friend zone. I lived there so long, I began to get mail there and eventually received my college acceptance letter and diploma there. Just a couple of weeks ago, a guy moved onto my street who was interviewed by Michael Che of SNL. The experience was not wasted as I became proficiently familiar with the range of emotions central to the friend zone experience: discovery, delight, enchantment, captivation, mild obsession, awkwardness, courage, action, heightened euphoria, creativity, fear, courage, awkwardness, disappointment, questioning, despair, and sadness. Through my Friend Zone career, I’ve heard so many different reasons as to why I was being banished. “I’m not ready for a relationship,” “My parents don’t want me to date someone who doesn’t look like I do,” “I’m focusing on school,” “You don’t want to be with me,” “I’m guarding my heart right now,” and my all-time favorite “You are too much like a big brother, I don’t want to ruin our friendship.” All great reasons to not be in a relationship I’m sure. However, when you wait to state those intentions after the other party has communicated interest beyond friendship, and also, when you then soon after decide to date someone else, those reasons begin to look a little suspicious. BUT I digress. I’m grateful for being banished all those times because of two memorable episodes. What I gleaned from them changed my life. I’ve changed their names because I truly have no hard feelings for these people and don’t judge them, as this is just where they were at the time. I first met Lisa in March of 2012 at the birthday party of a mutual friend. We happened to sit by each other that night and by the end of the night, I walked her to her car and left with her phone number. The rest of the month we talked every single night and text constantly each day. Through getting to know her, I realized she had a 4-year-old daughter from her previous marriage. I didn’t even care because I cared about her so much. I got to meet her daughter, probably mid to late March. Easter was in April that year because that was when we had our first kiss. I took her to dinner the night before and we stood in the parking lot talking until the sun came up. I was hesitant to do it because of all my prior experience, but I did it anyway. I liked her and she liked me, so what was there to think about? Needless to say, I was bright-eyed and cheery that Easter Sunday, even though I had gotten no sleep. I had just become official with the girl I liked. We sealed it with a kiss. I soon learned that sealing things with a kiss doesn’t mean a rosy path ahead-just ask Jesus. Tuesday of that following week, I wanted to talk about what had happened that weekend because I was assuming we were official and wanted to confirm (used to be called “defining the relationship” or DTR in the old days). This is where I was hit with a barrage of red flags, but too blinded by infatuation and low self-esteem to see any of it coming. We were official, but she didn’t want it to be on Facebook. Also, she didn’t want to tell her parents. She was okay with me paying for her food and entertainment on dates and the kiss goodnight, but just didn’t want anyone to know about it. The only thing crazier than that was, I TOTALLY WENT ALONG WITH IT AND UPPED MY GAME. I figured if I contributed more, or displayed more admiration for her in my actions, that we could transcend our “secret status” and become public. I remember I was chilling with my best friend waiting to watch some Marvel movie. She texts me in distress. I didn’t have a car, so I explained the situation to my friend and he let me use his car. I left the movies to go to her. She needed a listening ear, and a shoulder to cry on and I was there. I consoled her, and after a quick peck went right back to the theater and made the showing. Her daughter’s 5th birthday arrived, and I took off work, bought a plethora of toys, had them wrapped, had custom cupcakes made and happily marched down there to be a part of the big celebration. This was all in addition to giving her rides to and from work, always making sure to have at least one flower to give her every time I saw her, and paying for our “secret dates.” I remember I had planned to go see one of my favorite bands at the Hollywood Bowl. I discovered she also liked said band and the concert was right around the time of her birthday, so I bought her a ticket and asked her to go. She consented (keep in mind the tickets were about 300 for nosebleed seats). She paid for the hotel rooms (we slept in separate rooms because I’m old fashioned like that) and I took care of gas and food. Towards the end of the trip, I had no money left and asked if she could chip in for gas. She LOST IT. Screaming and proceeding to have an EPIC meltdown. That was the last time I talked to her. Then a few months later, she texts me after seeing me at a local show saying how much she missed me, but then would take days to text back. Soon after, she didn’t text back at all. Around late May of 2013, I met Linda through a mutual musician friend. Linda was also a phenomenal singer-songwriter and I quickly became a fan of her work. We lived in different states, so I reached out via Facebook messenger, and over the span of 6 weeks, hundreds of messages were exchanged between the two of us. We even got creative and would leave 15–45 second voice messages via Facebook. It was so much fun and so exciting to see the notification pop up and read/listen. Around the 7th week, I amassed all the courage I had to tell her I liked her via FB voice message. I waited for the longest 5 minutes EVER before seeing a voice reply. I clicked it to hear the shocking news that SHE LIKED ME BACK. Instantly I went to beyond cloud nine where we upgraded to SMS text, daily late-night phone calls, and Skype sessions. Things were awesome. I distinctly remember the moment in our relationship when I felt that I had finally broken my apparent friend zone curse and this could be the real thing. I had a show opening for the biggest artist in my genre. It was at a theme park and there were over 7,000 people there to see him and we were opening. This was the biggest show of my career. I’m perhaps 3 minutes in and as I look in the crowd, I see HER. She’s so pumped to see me on stage doing my thing and I’m over the moon that she’s there. She was taking a road trip back to her hometown and adjusted her plans so she could make it. The best night ever. I got to meet the artist I had looked up to, and she and me, along with my DJ, his wife, her mom all went out to eat afterward. When the meal was over and we were saying goodbye, I gave her some unique and thoughtful gifts before she left. We had to drive 13 hours back to Phoenix, but I was so high I couldn’t sleep. This was such an incredible feeling. I’m leaving the friend zone and I couldn’t be happier.. But again, it was short-lived. I immediately went on tour from that show for a week and as the week went by I noticed a change. We went from texting back within minutes, to hours. From hours to days. Talking every day, to being sent to voicemail more and more. I had planned a trip to go see her in her hometown and take her to an NFL game, but when things started to go cold, I instinctively pulled back and just stopped texting. I would then receive texts from her pulling me back in, only to be left alone when I would start pursuing her. I had to move on because I was tired of being on such a roller coaster. I had to delete her on Facebook, as well as her number. I still remember her text “DID YOU DELETE ME FROM FACEBOOK? !” I don’t even remember if I replied. Looking back, I see that these two stories, as well as scores of others I experienced, all mirrored some 3 act tragedy. Act I: We become friends, and I am doing things I wouldn’t do for another friend to show interest, while an emotional connection develops. Act II: I decide to go “all in” and put my cards on the table and let my feelings be known. Act III: Watch her distance herself, but still reach out for emotional connection. Now, this is where some would say “she doesn’t owe you anything. Quit trying to criticize, ridicule, or blame her for not consenting to sleep with you. You’re disrespecting her physical & emotional boundaries while contributing to a culture that normalizes this type of violating women!” While I denounce the instances in which this takes place and think it’s fundamentally wrong to say someone friend zoned you because they wouldn’t sleep with you, I think it’s equally as wrong to be emotionally reckless by not being upfront, honest and confident that both parties are on the same page about the state of the relationship. It was never about wanting to sleep with the other person, but always about being together-to see her in the crowd and think, “That’s my girl!” and be so overwhelmed by that thought and for her to see and think the same about me. It was about courtship and companionship. Many of the people who come up to me saying they relate to the song I wrote on this subject on so many levels feel the same way. They are looking for something more lasting than just a one-night stand. 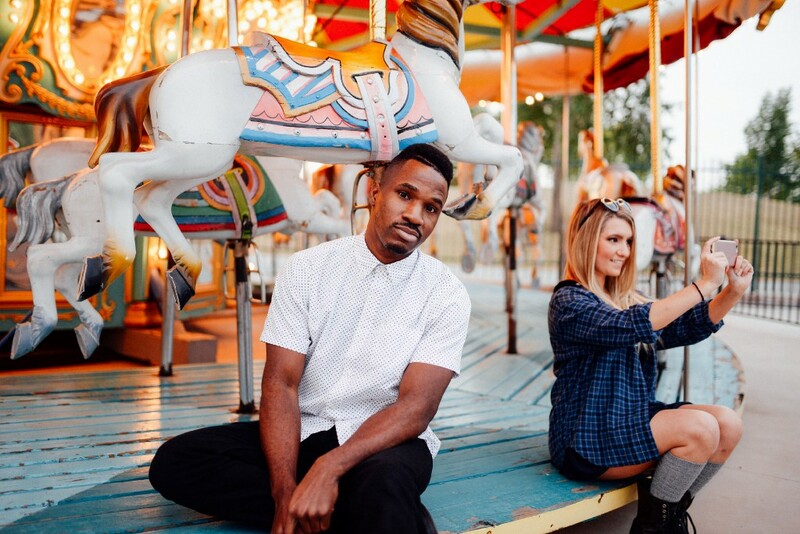 Which brings me to the point: How do you find that lasting relationship while avoiding the Friend Zone trap? I’ve taken all my bumps, bruises and lessons learned along the way and condensed it into 3 steps. It’s incredibly tempting to just bring out the big guns when you like someone. DON’T FALL FOR THAT TRAP. Start small. Think of it as a marathon, not a sprint. Little things, and spread them out over time. I’m tempted to list examples, but as a rule of thumb, take that grand thing you were planning on doing and cut it back by 75%. Now, do one or two of those things a week or so for a couple weeks, then increase in percentage or frequency BUT NOT BOTH AT THE SAME TIME. Keep in mind that this is a marathon, not a sprint and also if it works out, you have the rest of your relationship to be as extra as you want, and it will be more appreciated. Appetizers until it’s safe. The only way you’ll know if it’s “safe” to bring out bigger guns, is IF YOU SAY SOMETHING. Now I hear you right now shouting me down “BUT GOSPEL WHAT IF SHE SAYS SHE ISN’T INTO ME LIKE THAT? ?” It’s simple: she isn’t into you like that, you know where you stand, and you can move on. This is undesirable because of the pain that will be experienced, but this pain is momentary and is infinitely less than being strung along only to find out after wasting time, money and energy you could have devoted to ANYTHING ELSE. Speaking up means that you’re okay with knowing the truth, even if it’s not what you had hoped. It also means there’s a chance that the other person could be TOTALLY into you, but didn’t know if it was mutual. You really have nothing to lose and all the clarity and non-complexity to gain. An awkward couple of days is better than being strung along in ambiguity for an extended amount of time only to find out that your fears were legitimate. Take the guesswork out and speak up.